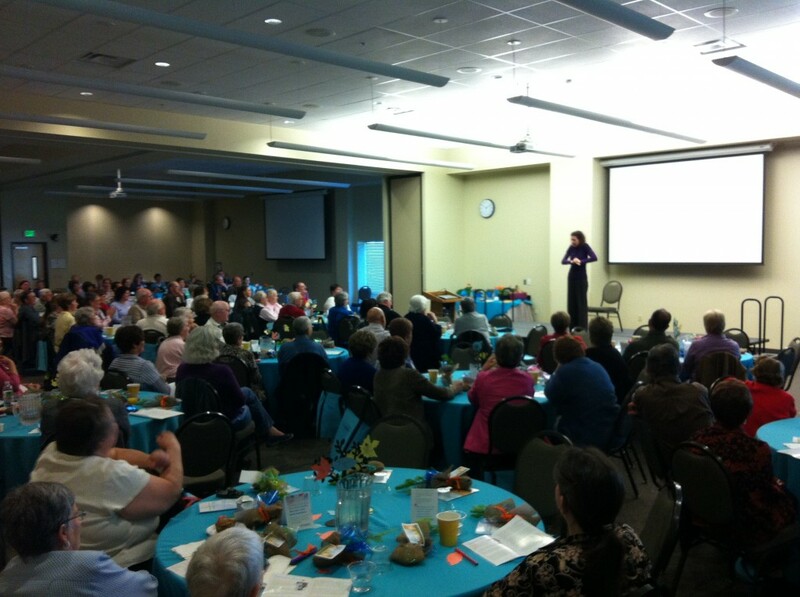 On Saturday I had the privilege of being the featured cancer speaker at the Survivor Celebration in Olympia, Washington. There were various speakers and activities to honor cancer fighters. What a terrific event! The planning committee did a fantastic job. The event was held in three-conference-rooms-opened-to-make-one-big-ballroom. There were round luncheon tables set up and beautifully decorated. Caterers brought yummy, healthy food and drink. There was a small riser-stage for me, which is all I need to perform! There were about 250 people in attendance, but the minute I started to perform I could feel us all pull closer, like one giant family. THAT is what I love about entertaining in the cancer community. That loving connection we all feel, having cancer in our lives. After the performance, I got to do the other thing I love: meeting, hugging, and talking with other survivors. Anthony and I have our table set up with DVDs of the “Jonna’s Body” movie, and we hang out while I get to ‘commune’ with my peeps! Hearing their stories and their fears as they go through treatment, and their incredible bravery, and hearing how much they enjoyed the performance… My heart is overfull. Thank you, Olympia. I loved being with you.